SNU Dining is now the food service provider on campus. 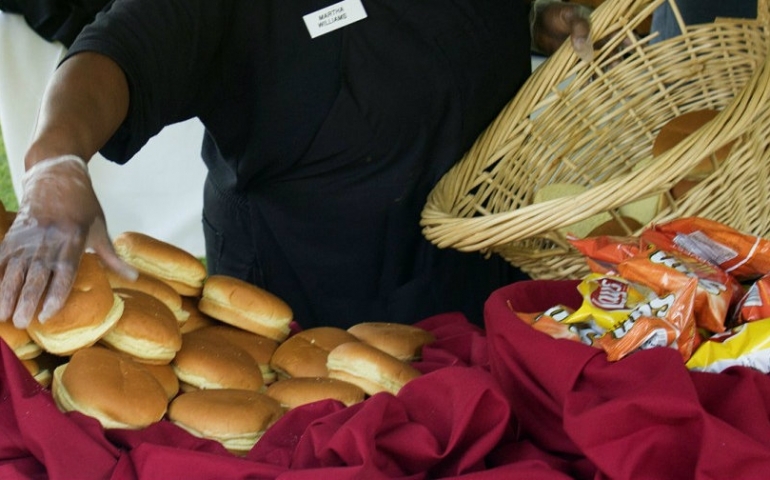 SNU Dining is contracted with Sodexo for back of the house operations like insurance, payroll, and food purchasing, etc., but they are managing the front of the house food service operations independently. Sodexo no longer drives menus or recipes. Staffing Changes Andrew Cox, SNU Dining’s new General Manager, said, “I only talk to the company, which is what I call Sodexo, about once a week, whereas past managers talked to them everyday.” Cox went to Culinary School and has 17 years of experience in Food Service. He worked as a chef in restaurants and hotels in Santa Clara and Palm Springs, California and as the Director of Operations at Oral Roberts University in Tulsa, OK. He hopes to add more recipes similar to those found in food trucks to SNU Dining this year. “I have experience in coming to troubled kitchens and turning things around. I am a chef by trade so my passion is for cooking great food, not just running a business,” said Cox. SNU Dining is working to take the food service to a much higher level. Staff members that were retained by SNU Dining, such as Ian Wagner, Executive Chef, Elias Ramos, Food Service Manager, and Wendy Blackburn, Sous Chef, attended a three day workshop to retrain them and to expose them to a higher level of service. “[After the training], I saw the staff making different decisions and becoming more creative in the kitchen,” said Cox. A full time baker was hired to make the breads and desserts for SNU Dining. Additionally, Cox hired a manager for the evenings and weekends so that someone will always be around. “Most of the complaints about past dining experiences were about meals served when the manager was not around. Our goal for all meals is to make wholesome food right here in our kitchen, and we need accountability for that,” said Cox. Sustainability SNU Dining will source beef, fruit and other items from farms in Kansas, Texas, and Missouri. “Oklahoma doesn’t have many large commercial farms, and the ones that exist only provide their offerings for like a week but we will do our best to source it from surrounding states,” said Cox. The staff’s emphasis is on putting quality food into a variety of delicious and healthy recipes. Dining Remodel and National Food Chain The changes to management style represent the largest change that will be noticeable this week, but the university has big building plans. The north side of the library will be remodeled into a Starbucks Coffee Shop which will have drinks, bakery items and a few prepackaged meal options. The architecture will include a glass wall like J.D. and the Mary West Science Laboratory. Once that is completed, which is estimated to be by Winter 2014, Pop’s lounge will be closed, and Pop’s Burger Company and a national chain will be brought in. The Dining Room will serve Pop’s menu from 8pm-10pm Monday-Thursday during the transition. Different chains are still being discussed and will be chosen by a panel of students and staff. Cox specifically said that Moe’s Southwest Grill and World of Wings are major contenders. Chick-Fil-A is being considered but its university menu is so limited that it doesn’t seem to be a good option. SNU Dining hopes to have Starbucks and the downstairs food service venues stay open until midnight each night. After the chain is put in downstairs, which will hopefully be done by the end of Spring 2015, the upstairs dining hall will be remodeled for Fall 2015, and new furniture will be brought in. Cox hopes to have more soft seating for a cafe/hang out atmosphere and give students the ability to see all aspects of food preparation in the remodel. Student Board of Directors SNU Dining plans to organize a student board of directors from diverse backgrounds that will meet twice a month to discuss what is going well and what things should be improved upon. Comment cards have been moved near the restrooms to give students more privacy and access. SNU Dining is working to address student food service issues through some good changes, intermediary actions, and some well intentioned plans. Keep in touch with SNU Dining on Facebook and Twitter. Prev Post18 Tips for Making Your SNU Experience Amazing!